Every once in a great moon I head out to a camera store in Pontiac off Telegraph Road. When I do, I drive back past the corner of Huron and Woodward. Two great old store fronts there scream for photos before they will eventually disappear. 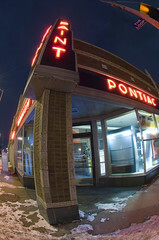 The Pontiac Paint & Vanish store is one of those.